The Saratoga Inn is a casual, laid-back bed and breakfast with breathtaking views of the Cascade Mountains and the Saratoga Passage. The family-friendly inn features comfortable accommodations and amenities, inviting common areas, delicious home cooked breakfasts and an array of activities around the area to enjoy. Opened in 1994 as “The Harrison House,” the 16-room Inn is set on Whidbey Island and is designed to offer privacy and peace for both leisure and business travelers. Guest rooms and suites are spacious and bright with king or queen-size beds with plush linens, private bathrooms with antique claw-foot bathtubs and deluxe toiletries, and ample sitting areas with sleeper sofas for extra guests. The Saratoga Inn serves a hearty homemade breakfast every morning and cheese and wine appetizers in the evenings and guests can enjoy a variety of activities around the Inn, such as hiking, mountain biking, kayaking, whale-watching or exploring the nearby town of Langley. The Saratoga Inn features a range of guestrooms and suites with elegant décor and antique furnishings, private bathrooms with tiled showers and claw-foot tubs, and spacious sitting areas with gas fireplaces and sleeper sofas. Modern amenities include air-conditioning, HD televisions, DVD players, alarm clocks and radios, and complimentary wireless Internet. Queen and Deluxe Queen Guestrooms feature queen-size beds with plush linens, private bathrooms with tiled showers, plush towels and deluxe bath products, and sunny sitting areas with comfy sofas and gas fireplaces. Modern amenities include air-conditioning, HD televisions, DVD players, alarm clocks and radios, and complimentary wireless Internet. 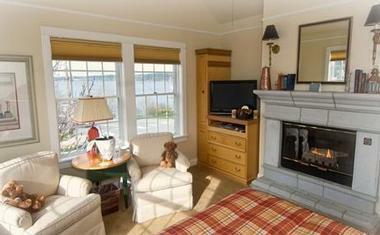 Queen guest rooms boast beautiful views of the Cascade Mountains and the Saratoga Passage. King and Deluxe King guestrooms feature king-size beds with plush linens, private bathrooms with tiled showers, plush towels and deluxe bath products, and sunny sitting areas with comfy sofas and gas fireplaces. Modern amenities include air-conditioning, HD televisions, DVD players, alarm clocks and radios, and complimentary wireless Internet and these rooms offer views of the Cascade Mountains and the Saratoga Passage. The Carriage House Suite is over 700 square feet in size and features a king-size sleigh bed with plush linens, and a private en-suite bathroom with an antique claw-foot bathtub, tiled shower, and heated flooring. The suite has a spacious sitting area with a queen-size sleeper sofa, comfortable seating, a gas fireplace and a fully equipped kitchen with modern appliances and cookware. 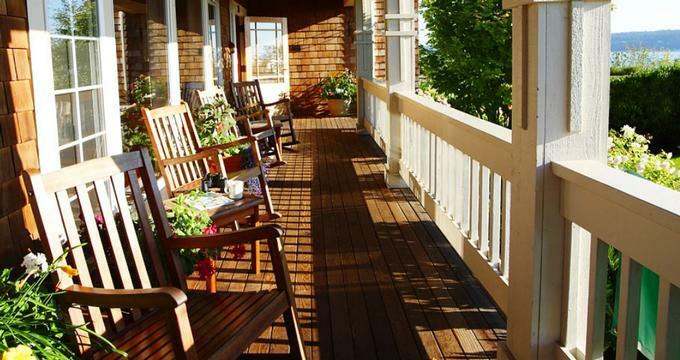 The suite is air-conditioned and has a private deck with beautiful views of the Cascade Mountains and the Saratoga Passage. A delicious home cooked breakfast is served every morning in the dining room and includes hot and cold choices, fresh fruit juices and fruit platters, and hot coffee and tea. In addition to the deluxe accommodations, The Saratoga Inn provides an array of amenities to enhance guests’ stay. Complimentary amenities and services include a homemade breakfast each morning, cheese and wine appetizers every afternoon, dark chocolate or cookies on arrival and hot beverages throughout the day. Other services include free wireless Internet and local telephones calls, games, puzzles and cards in the Inn’s common area, DVD movies from reception, and free parking. A daily housekeeping service is also available. The Saratoga Inn is located on Whidbey Island, which offers a variety of things to see and do from hiking, mountain biking, fishing, horseback riding, beachcombing, shopping and dining out. The Saratoga Inn offers a unique venue for business meetings and other functions for up to 12 guests. In addition to providing a beautiful site for special occasions, the Inn provides a range of services, including state-of-the-art technology such as a television and DVD player, a large format projector screen, and whiteboard, notepads and pens, a beverage and snack service, and complimentary wireless Internet.